Use your compatible Garmin cycling, fitness or handheld GPS device to measure your speed and cadence with these wireless ANT+ sensors when fitted on your road or mountain bike. Simply attach the Speed/Cadence ANT+ enabled sensors onto your bike and it will wirelessly send reports of your pedalling strokes per minute to the screen of your compatible Garmin device. Compatibility: Compatible with a various Garmin ranges including the Edge 25, 130, 500, 510, 520, 520 Plus, 800, 810, 1000, Explore 1000, fenix 2, fenix 3, eTrex Touch 35, Forerunner 230, 235, 310XT, 910XT, 920XT and VIRB X, XE. To view the full compatibility list of Garmin products click here or scroll down to compatibility list. Are you a keen cyclist? Would you like to monitor your performance and view your speed and cadence on your compatible Garmin units screen or later at home on your PC or smartphone? Well you can do exactly that if you buy and fit the Garmin Bike Speed Sensor and Cadence wireless ANT+ sensors. Using ANT+ technology the Speed and Cadence sensors will wirelessly communicate with and send information to your compatible Garmin device. The Speed Sensor attaches to the hub of either wheel and self-calibrates with your compatible Garmin Edge to give you accurate speed and distance at all times, including indoors on the turbo trainer. Setting up and installing the speed/cadence ANT+ sensors is easy, with all the parts and fixing straps, hooks, etc needed included with the pack when purchased from ActiveGPS. 1. Place and hold the speed sensor on top of the wheel hub. 2. 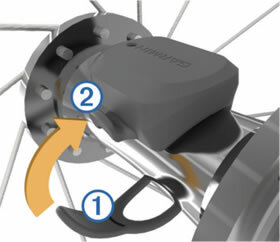 Pull the strap (1) around the wheel hub, and attach it to the hook (2) on the sensor (see diagram below). The sensor may be tilted when installed on an asymmetrical hub. This does not affect operation. 3. Rotate your bikes wheel to check and ensure free movement. The Speed Sensor should not contact other parts of your bike. 1. Select the band size that fits your crank arm (1) securely. 2. 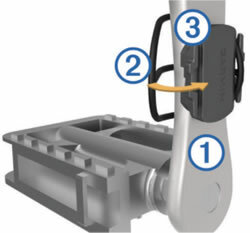 On the non-drive side, place and hold the flat side of the cadence sensor on the inside of the crank arm. 3. Pull the bands (2) around the crank arm, and attach them to the hooks (3) on the sensor. 4. Rotate the crank arm to check for clearance. The Cadence Sensor and bands should not contact any part of your bike or shoe. To read more about installing and setting up the Speed/Cadence Sensors we recommend you read the instruction manual. What is the bike speed/cadence sensor compatible with? Garmin Approach S60, fenix 2 Special Edition, fenix 3 HR, Sapphire, Sapphire HR, D2 Bravo, D2 Charlie, Descent Mk1 Edge 25, 130, 500, 510, 520, 520 Plus, 800, 810, 820, 1000, 1030, Explore 820, Explore 1000, epix, eTrex Touch 35, Touch 35t, fenix 2 fenix 3, fenix 3 HR, fenix 3 Sapphire, fenix 5, fenix 5S, fenix 5X, fenix Chronos, Forerunner 35, 230, 230, 235, 310XT, 630, 645, 645 Music, 735XT, 910XT, 920XT, 935, Oregon 600, 650, 650t, 700, 750, 750t, tactix Bravo, Varia Vision In-sight Display, VIRB 360, X, XE, Ultra 30, vivoactive vivoactive 3, vivoactive HR. Was it another Garmin accessory, part or map update? 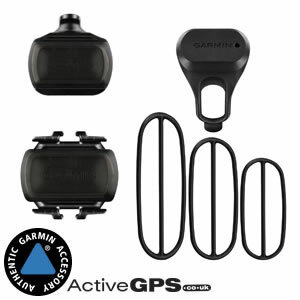 If it was click the following links to view all the Garmin accessories or maps. Alternatively if you have a question about the portable friction mount our contact page is the place to go to ask us a question.